The end of headstand and shoulderstand? Our intention in teaching and practicing yoga at QSY is to grow as individuals and deepen our sense of connectedness with the wider world. 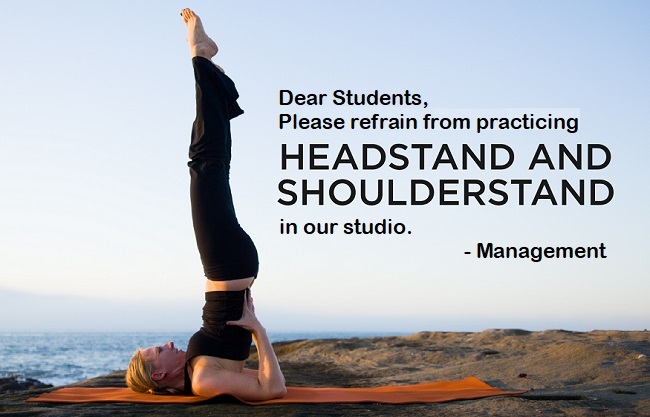 While practicing headstand and shoulderstand, or other “fancy” or extreme poses, may be fun and provide learning experiences, they do not necessarily bring us any closer to that aim. Inversions at QSY (Queen Street Yoga): We choose not to teach full Headstand and full Shoulderstand (where weight is placed on the head and neck) due to safety concerns for the spine. We ask that students do not practice these poses before, after, or during public classes for the safety of all QSY members. What is yoga without headstand and shoulderstand poses? They are not "extreme" poses. They are the king and queen of yoga asanas. Why do studio owners see them a dangerous thing to play with? ...the awareness is more important than rushing through a series of postures just to say you’d done them. The vast majority of people should give up yoga altogether. It’s simply too likely to cause harm. Not just students but celebrated teachers too, injure themselves in droves because most have underlying physical weaknesses or problems that make serious injury all but inevitable. Instead of doing yoga, they need to be doing a specific range of motions for articulation, for organ condition to strengthen weak parts of the body. Yoga is for people in good physical condition. Or it can be used therapeutically. It’s controversial to say, but it really shouldn’t be used for a general class. One of the most common sights in downtown Toronto is slim, professional women pacing fast across the city with rolled-up yoga mats under their arms and determined looks heading towards one of many yoga studios. Do they give a damn for Glenn Black's warning about the practice of yoga? However, today, yoga is a $5 bn (and more) industry in North America with an estimated 21 million practitioners. And in Toronto, at least, tales of yoga disasters are not difficult to find. Dr. Raza Awan, a sports injury specialist in Toronto who uses yoga for rehabilitation, started tracking yoga injuries after noticing there wasn't much-published data. "If someone is too flexible and gets into the end range of a pose without good support and muscle stability, it can cause wear and tear on joints", Awan said. "While injuries to the lower back, knees, and wrists are more common, hip injuries can be more significant and need surgery", he told CBC's Kim Brunhuber. The controversy about the practice of postures like headstand and shoulderstand is nothing new. According to Dr. Timothy McCall, medical editor for Yoga Journal, the headstand is “too dangerous for general classes." This view, as he has indicated, directly comes from his own personal experience. The way these poses are usually taught in yoga studios are questionable. I don’t think it takes a biomechanical genius to figure out that 90-degree shoulderstand is at the very least, uncomfortable. It is believed that headstand if it is done properly, there is no weight being placed on the neck. However, imagine someone with a problematic spine who is overweight and leads a sedentary life. These poses are a great source for an injury to happen. Every pose is a personal experience and it does not mean it will be everyone’s experience. To be fair, there are lots of ways to modify these poses to make them safer, however, just like any physical activity, repetition either strengthen body or increases the chance of injury. Whenever you do headstand or shouldderstand, the blood flow to brain increases. This can help to improve concentration, focus, and mental functioning in general, keeping your mind clear and sharp. The concentration and focus required to practice these poses forces you to turn your attention inwards, which is extremely beneficial for that feeling anxiety, stress, fear or other worries. These poses require strength in the shoulders, upper arms, and back, to support the weight of your entire body, very little weight should actually be on the head. Practicing these postures tones and strengthens arms and shoulders. When it is said that an asana is dangerous, or even this asana helps with this problem, or this pose is beneficial for that problem is just hearsay nothing else. The problem with these kinds of statements is that they are completely lacking context. You cannot ascribe danger and benefit of the particular postures apart from the people that are doing them. I would like that, 200 hours, yoga teachers stop talking about asana in an abstract sense. Yoga only exists in the concrete, in the personal, individual sense. And this concrete consists of a person putting their body with all its limitations into a proper shape. If you take the personal practice as a starting point, then you can have a talk about asana, the correct alignment, the pose's dangers or benefits.